One gents, Breitling Chronomat Chronograph wristwatch electronically tested Stainless Steel, Case: 40mm diameter, Case Back: engraved with the manufacturers name, information, and ID numbers, Crown: scalloped, set between the chronograph pushers, Bezel: uni-directional, engraved with indices, separated by four raised stations, Crystal: synthetic sapphire, Movement: automatic Swiss Chronometre, Breitling 13, Power Reserve: 42 hours.Case Ring: fixed Tachymetre scale, Dial: White color, with baton pointed hands & raised numerals, Chronograph Functions: three Silver ringed sub-dials for continuous seconds, minutes, and hours, Date Window: three o'clock position. 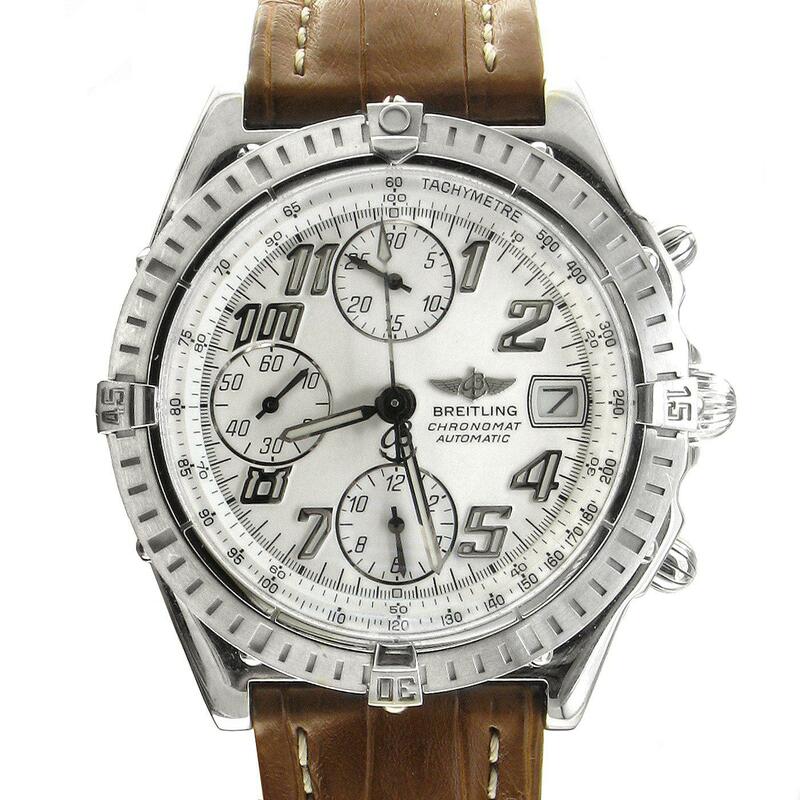 Bracelet: Brown saddle-stitched Breitling leather strap with a stainless steel deployment clasp. Condition: G-5 Fine. Eight inch length, adjustable. Bright polish finish.